It might not have the name-brand cachet of iRobot’s Roomba or Samsung's Powerbot, but the Roborock S5 can hold its own with both those robot vacuums. The Roborock S5 comes with laser navigation, floor mapping, and both vacuuming and mopping functions, so you can tackle all your floor cleaning from the comfort of your couch. The Roborock S5 impresses right out of the box with its bright white finish, a welcome change from the samey shades of black common to most robot vacuums. On the top is a button that activates automatic cleaning, another for spot cleaning, and a third for recharging, which essentially works like the “home” button on other robot vacuums, sending the Roborock back to its charging dock. A turret on the top of the vacuum houses the Roborock’s laser distance sensor and brings its total height to about 3.8 inches. A 0.6-liter dustbin is located under a lid just behind it. A cleaning tool for the untangling hair from the main brush is latched into a slot right next to it—a thoughtful detail as these tools are easily misplaced. 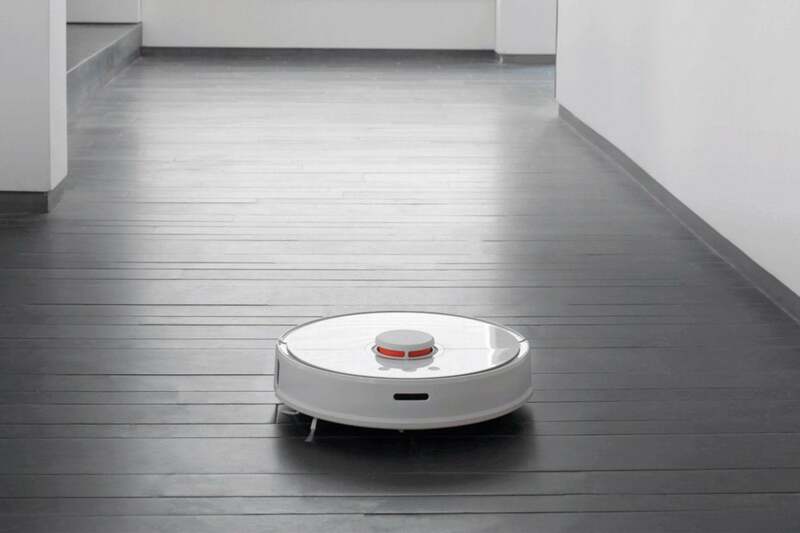 The Roborock S5 includes vacuuming and mopping functions. On the underside are a roller brush and a single spin brush for edge cleaning, two main wheels, and an omnidirectional wheel at the front. For mopping, the vacuum comes with a separate water tank and cloth that you attach to the bottom when you’re ready to clean hard flooring. Another welcome design detail is the inclusion of a moisture-proof mat. You snap this onto the charging doc so that residual water from your mopping won’t drip on your floor while the Roborock is recharging. You then just plug the dock in and set the vacuum on its charging pins. While it’s charging, download the Mi Home companion app, add the Roborock, and follow the prompts to connect it to your Wi-Fi network. For the initial cleaning, I turned the Roborock loose on a 50-plus-square-foot area that included carpet, hardwood, and linoleum littered with everything from pet hair to paper scraps. The vacuum methodically cleaned a small area of floor thoroughly before moving onto another, building a map as it went. Zoned Clean Up lets you scale one or more areas on the map using a resizable box and then dispatch the vacuum there to clean. It’s a determined little bot, too. Where some robot vacuums will change direction as soon as their front bumper encounters resistance, the Roborock attempted to push through most obstacles when it could. Sometimes, that actually helped as when it encountered a pair of my kid’s shoes and just pushed them along until they moved out of the way. It could also be potentially disastrous, like when it insisted on getting under a guitar stand until it met enough resistance to change direction just before tipping over an expensive axe. The Roborock had no problem navigating the transitions between the different floor types, nor did it get hung up on any furniture. Its height prevented it from getting under my couch and kitchen cabinets, but it left the wide-open spaces free of debris. That includes wall edges, which are tough for some circular vacuums. The spin brush deftly swept any dirt into the path of the main brush so it could sweep it into the suction. And the whole cleaning took just 21 minutes according to the app. While this auto mode is great for general maintenance cleaning, the app gives you a couple more options. 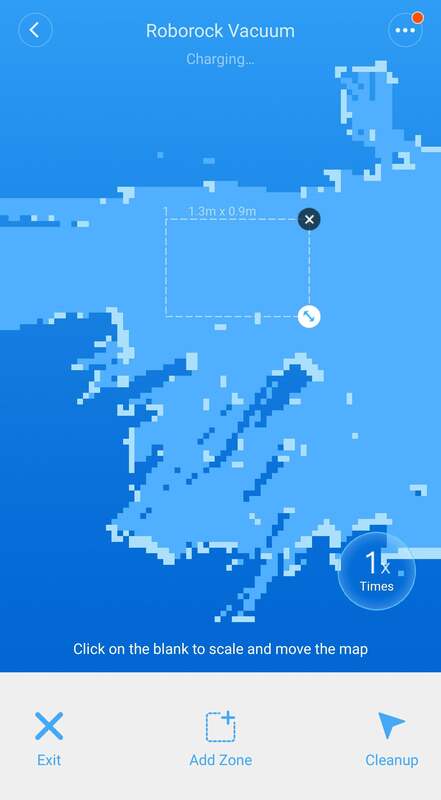 One great one, especially if you have small children, is a location feature that lets you click a spot on a room map and send the vacuum to it. Then you can activate Spot Clean mode, also from the app, for a concentrated cleaning. 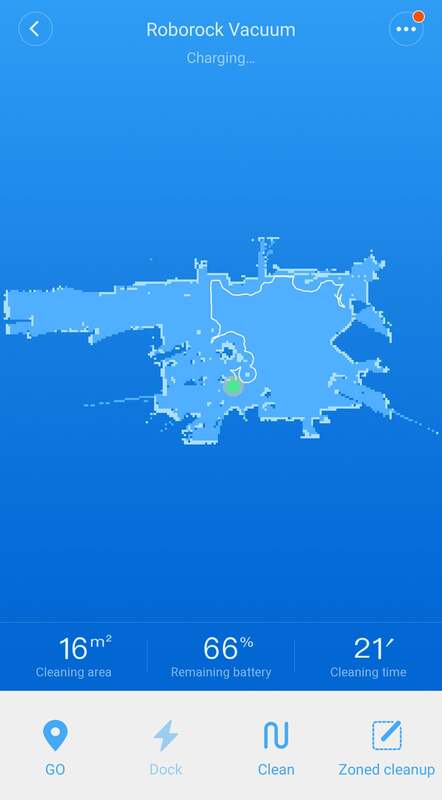 The other is Zoned Clean Up, which lets you scale one or more areas on the map using a resizable box and then dispatch the vacuum there to do its thing. To mop swept floors, you need to attach the mopping module. This consists of a flat water tank and a cloth. It’s fairly uncomplicated: First you dampen the cloth then attach it to the bottom of the tank. Then you fill the tank and slide it into its slot on the bottom of the vacuum. Finally, select the mopping mode in the app and start the cleaning. 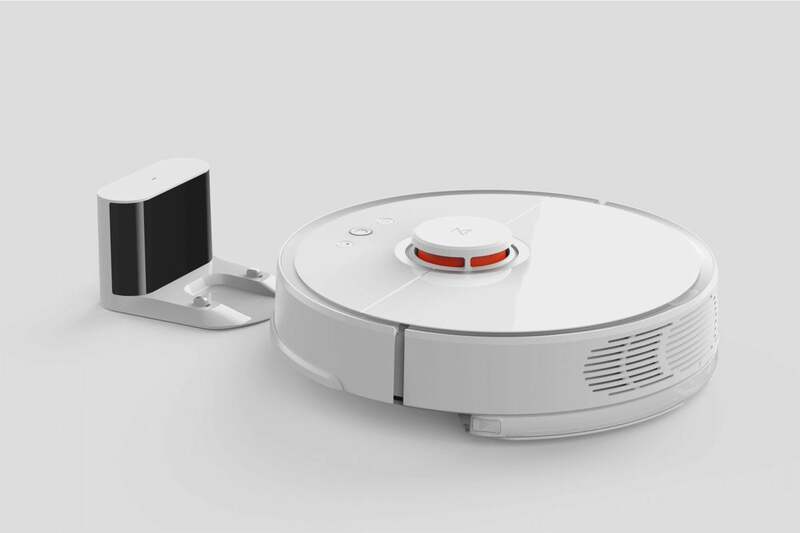 The robot vacuum uses laser navigation to build a map of the cleaning area. Unfortunately, the mopping performance didn’t impress as much as the vacuuming. It didn’t do much but smear a light sheen of water on my floor, and unevenly at that. It lifted only the loosest dirt off the surface, and it’s certainly no substitute for a thorough hand mopping. More problematic was that the Roborock doesn’t avoid carpeting when it’s in mop mode—as Ecovacs Deebot OZMO 930 does—nor does it recognize when it has moved back onto carpet and stop mopping. As a result, I ended up with several feet of damp carpet when I didn’t supervise a kitchen-floor cleaning. The Roborock’s app interface is cleanly designed and intuitive to use. The map the vacuum builds during its initial cleaning fills most of the screen. Underneath, the size of the current cleaning area is displayed, along with the cleaning duration, and the remaining battery charge as a percentage. At the very bottom, are buttons to activate the various cleaning modes. The Settings menu offers a wealth of additional features you’re sure to use. I’d recommend activating Carpet Mode right off the bat, as it allows the Roborock to automatically recognize carpets and increase suction. Also helpful is a “do not disturb mode” that lets you set a time when the vacuum should not clean. This is also where you can access your cleaning history, view how long the various vacuum components have until they need to be cleaned or replaced, and even access manual vacuum controls in the form of a virtual remote control or joystick. This story, "Roborock S5 Robot Vacuum Cleaner review: This premium vacuum busts dust and mops, too" was originally published by TechHive. The Roborock S5 Robot Vacuum Cleaner's has superb cleaning capabilities and map-enable features make it a great choice for those looking for a premium household helper.